Sorry for the time in between posts lately. It’s been an odd mix of attending conferences, getting ready to attend conferences, and spending time in the hospital being treated for skin infections picked up at those conferences for the last couple of weeks. Long story. Let’s talk about something more pleasant than cellulitis, namely screencasting. All this screencast is, is a Keynote slide deck that I prepared with a voiceover. Sometimes this is all you need for the task you want to accomplish. For those non-Mac people out there, Keynote is Apple’s version of PowerPoint — a presentation software tool that comes with the iWork office suite. If you have a Mac and don’t use iWork, it’s well worth looking into. Many people find Keynote to be much better designed and easier to use than PowerPoint or any of the other presentation tools out there. The basic gist behind a lecture capture is that you are just using a presentation tool to give a normal presentation, and capturing the audio and the video that goes with it. This does not include any sort of writing on the board; I’ll deal with that in the next post in this series on “whiteboard” screencasts. But everyone should note well that the lecture capture approach is often part of my screencasts but rarely the entire thing. Many of my MATLAB screencasts are set up by brief, 1- to 2-minute long lecture captures before cutting away to a live screencast straight out of MATLAB. So even if lecture capture doesn’t sound like your thing, it’s worth thinking about. 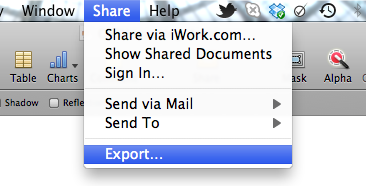 There’s an option on the screen that comes up next to export to Quicktime, and that’s what to select. (I use the default video/audio options; you can tweak these.) And presto — you have a nice, high-quality Quicktime movie of your lecture that’s suitable for sharing online or burning to a disc. What happens next is a bit different from Keynote. PowerPoint does what it says: It attaches an audio narration to each slide as you click through it in presentation mode. 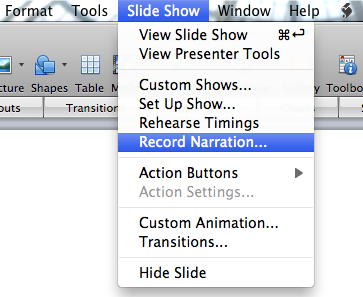 There is the option — but not a requirement — to record the timing of the slide transitions as well. In Keynote, the transitions are automatically timed. To turn this voiceover-plus-presentation into a movie, just go to File > Save as Movie… and there are plenty of options to choose from. I should mention that as for a microphone, I just use the built-in microphone on my Macbook Pro. I have used a USB headset microphone before and I think it did improve the audio quality noticeably, but to be honest with you: I’m really cheap. If I can get good audio quality that nobody complains about using the built-in mic, why spend $50 to get very good audio quality with a USB mic? One of these days I’ll break down and buy one, I’m sure. Until then I pinch my pennies. There are a couple of issues to think about at this point regarding lecture captures. What if you want to use some other presentation tool besides Keynote or PowerPoint, for example the Beamer package for , or Prezi? What if you wanted to record portions of a lecture at a time and stitch them all together later, or conversely what if you wanted/needed to edit out or enhance portions of a lecture capture you created with Keynote or PowerPoint? For those kinds of tasks, I would turn to my #1, go-to tool for almost all my screencasting needs: Camtasia for Mac. Camtasia is an all-purpose video and screencasting tool that does an outstanding job with just about anything I could possibly want to do with a basic screencast. There’s so much to Camtasia, and we are going to need to refer to it so much in later posts about whiteboard and demo screencasts, that I’m going to deal with Camtasia (and its alternatives) in a separate post. Meanwhile, if you have other tricks and tips about lecture capture screencasting, please share in the comments. Longtime readers will remember that I’ve owned an iPod Touch for a couple of years now, and it’s a marvelous device. The only things that kept it from being the perfect handheld, for me, were the lack of a camera and the lack of a microphone for taking voice memos. For a couple of months, though, other issues came forward. I began to think about how having 3G connectivity to the internet would be nice. I realized that my ages-old Samsung phone was way past its prime. And most seriously, iOS 4 was slowing my iPod Touch down to a crawl. All these things, plus the fact that my college has a discount deal with AT&T, finally pushed me over the edge into iPhone territory. 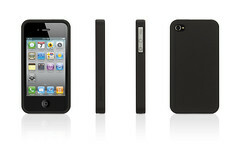 My wife and I both ordered iPhone 4‘s, mine a 32 GB model (to match the capacity of my iPod Touch) and hers a 16 GB model. The 16 GB model is apparently more popular, because it was put on indefinite backorder; so my wife, who lacks my techno-lust, opted to cancel her order and get a 32 GB iPhone 3GS instead. But my 4 got here in about a week, and I’ve been using more or less nonstop since then. Yes, I know Apple has become the new Microsoft in terms of monopolistic, closed-system approaches to hardware and software. Yes, I know Android is the platform that all the cool geeks are flocking to. Yes, I know AT&T is supposed to be horrible and that if I would just wait a few months, the fabled Verizon iPhone will appear. However, these did not deter my purchase in the slightest. While I did my homework on Android vs. iOS devices, I never got very close to going Android. I’m an Apple guy the whole way, for better or for worse. So, how’s the experience been? I signed up for the basic 200 MB per month data plan. At first this seemed like a sure bet for overages. On my laptop, there are sometimes single files that I download that are bigger than that. But I was surprised to find that by the end of the month I had only used up about 50 MB of that allowance, and that was not because I was stingy with my 3G internet usage. Indeed, it seemed like I was using the 3G for connecting to the internet a lot more often than I thought I would. I was way under my limit because 90% of the time, I am connected to a WiFi network. I just don’t need 3G that often — when I’m in the car or waiting in the dentist’s office, maybe, but these are not typical situations. Others may find themselves in more frequent need of 3G, though. The retina display is very impressive, especially on apps that are optimized for the iPhone 4. (My current addiction is Real Racing.) It does a particularly good job of rendering text (for example, in ebooks or PDF’s) to be very crisp and clear. The camera’s impressive too. It doesn’t have the megapixels of our point-and-shoot camera, but it’s also faster on the draw than that camera, and I like being able to take a photo or video and then send it directly to Facebook, Twitter, or to an email or MMS recipient. So I can really see the iPhone taking the place of both our still and video cameras. The hardware is very fast, very nice and crisp. It’s pretty clear to me that iOS 4 simply wasn’t intended to operate on hardware less than the iPad or iPhone 3GS, and the 3GS is pushing it. Most of the other features of the iPhone are identical to those of my iPod Touch, which is fine by me. The iPod Touch has been turned into a gaming device and handed off to my giddy 6-year old, who can’t believe that after two years of telling her to get her hands off my iPod, she gets to use it all she wants (within certain parenting parameters). I’m looking forward to more uses of the iPhone, especially as classes start soon and I can use apps like Attendance that really benefit from the camera and other iPhone features. The more I use it, the more I realize just how much of a game-changing device the thing really is. A hostage to my OS? Go the Windows or Mac route and you become a hostage to monopoly pricing. A happy hostage maybe but a hostage nonetheless. I’ve heard this before. If you commit to using proprietary systems like a Windows or OS X machine, you are locked in — you can only use Windows software and Windows-compatible hardware, and if Micro$oft decides to jack up the price of its OS to, say, $500 per license, then you can only say “Thank you sir, may I have another?” Although the computer market is not a monopoly, your initial choice of what system to use can effectively make it into one, for your own personal purposes. You’re a “hostage” to the whims of the company that makes your hardware and software and there’s no breaking out without a considerable cost. I’ve thought about this argument a lot in the past, in the context of the question: If for some reason I had to migrate away from using Macs, would I be able to do so and keep all my stuff? For example, suppose that next academic year, our IT department decides that everybody has to start using Tablet PC’s, or netbooks running Android, or something. What would become of all the documents I made in iWork? And so on. After my post, I decided to sit down with my Macbook Pro, look in the Applications folder, and see just how much of a “hostage” I really am to applications or data formats that work only on the Mac. The first thing to realize is that a majority of the apps that I use on a daily basis do not lock me in to a Mac whatsoever. These are apps that either store no data, or create data that are already in a universally-interoperable format. These would include: text editors, Twitter clients, IM clients, web browsers, editors (although I use this text editor for my editing and not a pure IDE), Preview (Apple’s image/PDF/etc. manipulation program), or the two computer algebra systems (Maple and MATLAB) I have installed. There are more apps that I use that are similarly un-locked. I would estimate that 70-80% of the work I do uses applications like these. I might not be able to port those apps themselves to a Windows or Linux environment, but I would certainly be able to do the things that I do with those apps in other environments. OmniGraphSketcher and OmniGraffle, used to create hand-drawn mathematical graphs and diagrams (respectively), create files in a format that cannot be ported from one OS to another since both of these are Mac-only. I can export the finished products to PDF or PNG, but not the source. Some documents I’ve created in iWork — Apple’s office suite — are so format-rich that although iWork allows documents to be exported to their Microsoft Office equivalents (and then to OpenOffice or Google Docs if needed), the formatting would probably break in the process. Again, if I were migrating from a Mac, I’d have to export all these to PDF and just realize I’d not be able easily to edit the source in another OS. iTunes (which I do not use on the laptop but use extensively on our iMac at home) is, of course, available for Windows, but if I had to leave iTunes behind altogether, probably 30% of the songs I have in my iTunes library did not come from my CD collection and were purchased before Apple decided to remove DRM from its songs. Those songs would be locked in. Any source files for projects that I created in iMovie or iDVD would be un-portable. OmniFocus, the software that I use for GTD (and which is therefore the lifeblood of my workday), is Mac-only but lets me export my entire GTD database to plain text, HTML, or CSV. I’d hate to stop using OmniFocus, but only because I really like how it works, not because I’d have to pay a lot of money or lose a lot of data to do it. My wife and I have a lot of gigabytes invested in iPhoto, but if we had to, we could simply export the photos in it to their raw JPG forms to a DVD and start over with something else. OmniOutliner is another Omni product I use a lot for crafting lecture notes, presentation or article outlines, and so on. It’s Mac-only, but again I can export the outlines to RTF, PDF, or a number of other formats. So it’s simply not true that I’m a “hostage” to Apple products. If Apple started charging prices for its products that I simply couldn’t afford, or if Linux ever got to the point where it works just as well or better than Windows or OS X and I switched as a result, or even if I ever just got tired of using Apple products, I feel confident that I could take my data and set up shop on a new OS without any major hiccups. But I should also point out that users have to be mindful of being locked in and work towards “future-proofing” their systems. A couple of years ago, I was making all my calculus materials in Pages with lots and lots of formatting. Then I got to thinking about these issues of being locked in and started doing all my materials in instead. ( will almost certainly never go away.) And most of my quick notes and drafts of documents are done in a text editor using plain text files rather than Pages or another highly Mac-specific program. I’ve been intentional about not getting locked in, and so I’m not. Other users who are less intentional might find themselves with much less freedom if they had to switch. But let’s put to rest the notion that using proprietary software locks you in to using only certain kinds of hardware and software. That is really just a canard. I’ve thought about this argument a lot in the past, in the context of the question: If for some reason I migrated away from using Macs, would I be able to do so and keep all my stuff? After my post, I decided to sit down with my Macbook Pro, look in the Applications folder, and see just how much of a “hostage” I really am to applications or data formats that work only on the Mac. For the last couple of days I’ve been trying to install some new software on the Ubuntu Linux machine that my kids use in their playroom. Being able to get a real computer for the kids for about $75 (about half of which was spent on the monitor; the box itself is a castoff desktop from the college that I bought for $10) and run all the software they could possibly want to use at their age for free has been great. But having to deal with the technical side of Linux and the usability issues in software reminds me of why I no longer use Linux in my daily life. 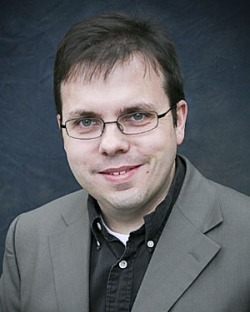 Back in 2001, when I started my new job at my current institution, I took the plunge and installed Red Hat Linux on my school computer rather than Windows. I had a colleague at my former work who was a Linux zealot and I figured I would take the transition period to my new job to switch operating systems. At the time, one of the driving reasons for doing so was the simple realization that, although I used computers all the time in my work and at home, I really didn’t understand how computers work. I figured running Linux would allow me a chance to learn, as well as expose me to some very good open-source software.